HTC is proud to present a host of new and exciting features with the release of HourGlass 3.8. A new way to track time and more robust reporting features are the highlights of the 3.8 update. More input options that result in better output for all HourGlass stakeholders. There’s more than one way to track time. Some businesses need to know what was done and when, while others are content with a simple summary of total time incurred. Now, HourGlass provides choice. In HourGlass 3.8, administrators have the flexibility to use either the classic Clock system, whereby start and end times are attributed to an entry, or the new Hours system, where the user can simply input the total time spent on a task. Classic Clock users can even switch over to this new time tracking system and maintain data integrity in reporting. This update simplifies making timesheet entries by enabling faster, easier and more flexible time tracking. HourGlass has always offered a full suite of robust reporting—tracking time, projects and costs like no other application, but it’s now even better! By default, reports excluded data from deactivated clients and projects. 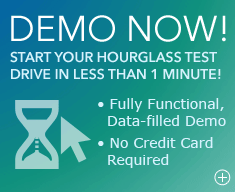 Now, with improved filter options via user-friendly checkboxes, and crystal-clear and intuitive labels, HourGlass provides the flexibility to easily include or exclude specific data sets from reports based on business intelligence needs, all at the click of a mouse! The result is more relevant, actionable and insightful data—enabling broader reporting, and better decision-making. HourGlass Mobile is an optimized interface for the HourGlass application that allows you to track time & expenses, and review assigned tasks easily and intuitively from your mobile device. Ensure more accurate time and expense tracking outside the office by recording events as they happen. Maximize task awareness by reviewing assignments quickly and easily from wherever you are. 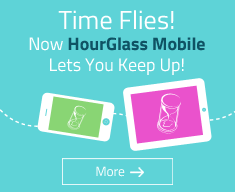 With HourGlass Mobile, save even more time and make even more money than ever before! When you’re busy being productive, travelling and attending meetings, tracking your time and expenditures isn’t always convenient. Sometimes, access to a desktop or laptop just isn’t available. These issues often lead to inaccurate tracking and forfeited billings. HourGlass Mobile solves this problem. With an easy-to-use, easy-to-access Timesheet and Expenses interface, optimized for smartphones and tablets, you can rapidly access your HourGlass account and make entries with “one-thumb and one-eye only.” Log a meeting with one client while you are on your way to a meeting with the next. Ensure more accurate billings and make more money! You have a lot to do. When you are travelling or on-the-go, priorities can become muddled and tasks can be forgotten. With Hourglass Mobile’s optimized, “My Tasks” interface, you can quickly and conveniently access your entire task listing, review it at a glance, and mark assigned tasks as completed, all with just a few thumb-clicks. With mobile task monitoring, stay organized and on top of your work; no matter where you are. HTC introduces a handful of fantastic new features with the release of HourGlass 3.7. New project management features and a broad set of usability improvements are at the centre of the 3.7 update, promoting stronger collaboration for an even more intuitive HourGlass experience. Fluid collaboration is essential for a successful team project. At the heart of the 3.7 update is the addition of an “Employee Comments” feature that allows task-related messages to be exchanged directly within the HourGlass application. Eliminate task related email threads by communicating and collaborating directly within HourGlass. No matter how big or small your team, employee comments promotes dialogue, facilitates communication and yields enhanced clarity along with improved productivity. In HourGlass 3.7, staying on top of your tasks has never been easier. The new “Due Date Alerts” function sends optional automated email reminders when task deadlines are imminent or overdue. Enable “Due Date Alerts” when assigning tasks and benefit from the increased awareness and accountability. View detailed descriptions for all your tasks using the new “Expand All” function within the “My Tasks” and “Task Manager” interfaces. This convenient toggle expands all task descriptions allowing for a complete overview of task details. Enjoy the increased awareness and convenience of this new usability improvement. The default filters for task manager are now set to show only active projects with assigned tasks. No need to sift through inactive tasks since all of your most relevant projects and tasks are now visible at a glance. The improved usability offered by these new defaults reduces the time it takes to locate active, assigned tasks, leading to a more efficient workflow. The Task Manager interface and the milestone view for My Tasks just got easier to read. Distinct heading colours for Clients and Projects now make the listing easy to view at a glance, reducing the time required to navigate listings and perform actions. Other interface improvements include a more consistent positioning for the date selector on the “MyTime” and “My Expenses” pages. The process for recovering forgotten passwords has been updated to include additional notifications. Users who are attempting to recover their password are kept in the loop throughout the process, ensuring a quick and painless password reset and quickly renewed access to the HourGlass application. HTC introduces a handful of fantastic new features with the release of HourGlass 3.6. Task enhancements and usability improvements are at the heart of the latest updates, providing a more powerful and intuitive HourGlass experience. Assigning tasks has never been easier. In HourGlass 3.6, task descriptions can now be detailed with advanced formatting options available in the rich text toolbar. Style text and create bulleted and ordered lists for crystal clear task descriptions that help reduce communication errors and improve workflow. In HourGlass 3.6, even more of your collaborative workflow is managed directly within the application. Files can now be attached to task descriptions, and then downloaded by recipients from within the task listing. Zip file attachment contents are clearly displayed in a user-friendly listing. This is a major feature addition that offers significant time saving and efficiency benefits. 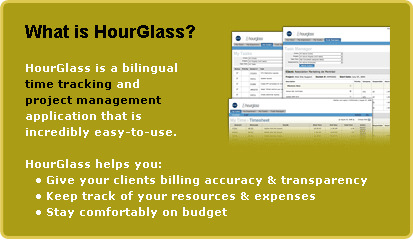 All files uploaded to HourGlass are stored in a secure client database with a 100MB capacity. Easily access, view, manage, and download files, all from within a convenient, consolidated listing. When entering information into HourGlass, you can now be more detailed than ever. The character limit for the details field in Timesheet and Expense entries has been increased and the field has been fine-tuned for optimal usability. Long entries now wrap automatically onto a new line while the field height is expanded, promoting accuracy and ease-of-input. Full detail entries are now also displayed in the reports. A predictive text feature has been added to the docket field in timesheet and expense entries. Start typing a company prefix or project name and a list of relevant dockets is presented for quick selection. Entries can be made faster than ever and without the need to memorize docket codes. HTC brings over a dozen improvements to HourGlass with v3.5. The strategy behind the latest round of updates was to provide richer information to administrators with respect to costs, budgeting and billability, and to improve the user experience. The new Budget Balance (by Project) Report allows management and administrators to stay abreast of project budgets by accounting for work performed and outside expenses. A project’s budget, an accumulated time to-date amount, an outside expenses to-date amount and a budget balance amount are all provided within this report. Decision makers and project managers now have even better information at their fingertips. Employee Hourly Cost can now be assigned to individual workers for the determination of project costs, payroll and profitability. The Budget Tracker report has been enhanced with an additional ‘by Employee Cost’ calculation method that provides even richer information on Project costing and profitability, which can also be used for payroll purposes. HourGlass can effectively calculate an Employee’s pay at their Hourly Cost based on the hours they have entered over a given pay period. To Bill Or Not To Bill? Prior to v3.5, manual changes for invoicing purposes were sometimes required to accurately bill Clients. Now, Projects can be deemed Billable or Non-billable. This update enhances Billing flexibility and efficiency while reducing the number of manual edits made to Employee time sheet entries. This is particularly useful in the ‘Non-billable’ early stages of project pitches. Once you get the project, switch it back to "Billable" status. “The first thing existing users will notice,” says HTC Account Director, Freddy Davy, “is that now every page is accessible with just one-click. It’s amazing how much of a difference just that change makes to productivity levels.” With one-click access, HourGlass users can hover over menus to ensure they select the appropriate tab or page they are looking to access. Project Managers can now send notification emails through the HourGlass system to alert employees when tasks are added or modified. This keeps the communication channels clear between team members. As Davy points out, “email notifications are a great way to keep the dialogue going and they let users follow HourGlass tasks using email clients like Outlook.” In addition, Completed Task Alerts let managers know when employees check tasks as completed, while Delinquent User Alerts notify them when Timesheets are left blank during the work week. But there was simply no product on the market that fit the bill. When our clients began asking us about it, it became clear we were not alone. So we built v2 to release to the public. And the rest is history! These highlights represent a small sample of the full list of the upgrades, features and usability improvements. 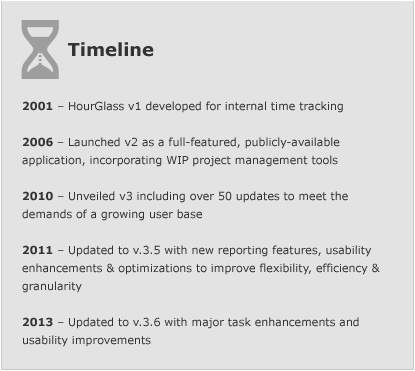 For more information about the v3 upgrades and enhancements to HourGlass, consult the HourGlass Release Notes.